Chakras are considered to be centers of energy in the body. In this DVD, UK-based healer James Philip provides a variety of short meditations designed to "purify" the chakras. There are a total of nine meditations, one for each of the seven chakras, plus "Chakra Express," a brief meditation for all seven chakras, and "Chakra Meditations," a longer journey through these seven energy centers. The Main Menu of the DVD offers a brief Introduction by Philip, the opportunity to Play All (this plays the individual chakra meditations only), and Audio Setup. For each session, Philip is alone and instructing via voiceover. The routines have several commonalities. Philip always opens by suggesting a comfortable seating or lying position and then by encouraging a focus on the breath "just as it is." He begins with the imagery of breathing in white light while breathing out the gray dust of what is no longer needed. He connects this white light to the ball of white energy that represents Mother Earth. I have provided a brief description (and time in parenthesis) for each specific practice below. Base Chakra (6:10m)--Philip states that this practice is for general well-being and to support family/home life. The white light here turns into a red flower/light at the base of the spine, spreading into the ground. Sacral Chakra (5:50m)--This session is designed for faith and trust in the universe as well as developing happy, healthy bones and close, intimate relationships. Here there is an image of an expanding orange flower just under the navel, developing into an orange light and concluding with a hood of golden light. Solar Plexus Chakra (5:46m)--Philip notes that this meditation helps with balance and improving relationship to self; he also states that it can be beneficial for self-care and reducing stress. The flower that develops just above the navel (or, as Philip says "top of belly") is yellow, expanding into a yellow light of self-love and again ending with a cloak of golden light. Heart Chakra (5:54m)--This practice is meant to assist with self-love and creativity as well as to foster abundance and authentic action. Here a green flower/light progresses across the chest, expanding to a feeling a being loved and concluding with a hood of golden light. Throat Chakra (5:30m)--Philip states that this session may help with boosting effective communication, including resolving conflict. He talks about a turquoise flower growing at the throat center, turning into a turquoise light and eventually resolving into a cloak of golden light. Third Eye Chakra (5:24m)--This practice is designed to help restore clarity and focus and also to sharpen "subtle" intuition. It is similar to the other routines, this time with an indigo blue flower. Crown Chakra (5:44m)--Philip states that this final chakra can help to reconnect to one's higher self and wisdom, to help one recover from low, periods, times of stress, and depression, and to restore gratitude and vitality. The flower is a many-petaled lotus which varies in shade, turning from purple to pink to magenta. Chakra Express (6:04m)--Philip recommends performing this session seated; he notes that it is designed as a "quick rebound" to become calm and connected. He suggests the routine for "busy days" as a means to press the "reset" button. Here he moves through each of the chakras in turn, starting with the base chakra and moving rather quickly until reaching the crown. Chakra Meditations (16:38m)--This final session is significantly longer than the others; Philip recommends it as a daily or weekly practice that can provide total relaxation and enhance well-being. In this practice, Philip again explores each of the seven chakras in turn, but he takes the time to meditate on each one before moving on. Overall, this is a nice offering from James Philip. Each session is soothing, and the short lengths are ideal for beginning meditators. My only complaint is that Philip talks very little about the distinct features of each chakra, which makes the practices feel rather indistinct and quite repetitive. For this reason, having prior knowledge of the chakra system may be helpful. 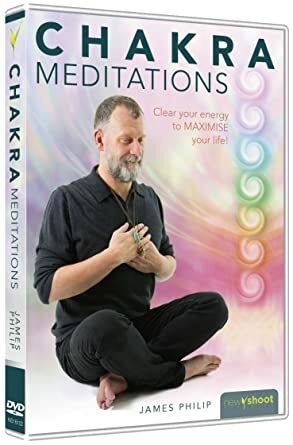 Otherwise, I would recommend this DVD for those interested in short, themed guided meditations.